Description : DiscRevolt provides physical solutions for digital delivery of media. 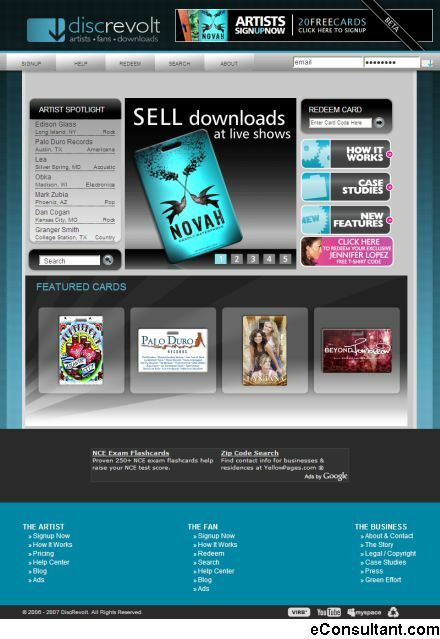 For artists, DiscRevolt is a way to sell downloads through artist-specific download cards. Artists upload songs to the DiscRevolt site and design artwork for a plastic download card. DiscRevolt prints the cards with a unique redemption code on the back, and artists then sell them to fans at live shows. Fans enter that access code on the DiscRevolt site and receive credits to download that artist’s media.